Wells and it’s product range helps food processors, manufacturers and healthcare organisations to better manage HACCP plans. The Hazard Analysis and Critical Control Point (HACCP) system is aimed at identifying and preventing hazards primarily in the food processing industry. The HACCP process follows has seven key steps in the process. Originally developed by NASA (North American Space Academy) to ensure the safe food and good health of their astronauts when in outer space, HACCP is now the most widely recognized and accepted food safety / management system. Cleaning and safe food handling are classic Critical Control Points. W R & D Wells and their hygiene and food safety product range enables all businesses involved in manufacturing, processing or retailing food products to better manage their HACCP plans. This process has the intention of avoiding hazards in the food industry such as Biological hazards, physical hazards and chemical hazards. HACCP is a continuous process of hazard control and prevention that requires a food business to take responsibility for the safety of food it produces. Chemical: Build-up of chemical disinfectants and detergents. Microbial: Arises from soil, surface water, animals, mould, dirty cleaning equipment and people. Allergens: Cross contamination of potentially fatal allergens such as dairy product in soy or nuts in food stuffs. Most of our products are available in 6 colours. 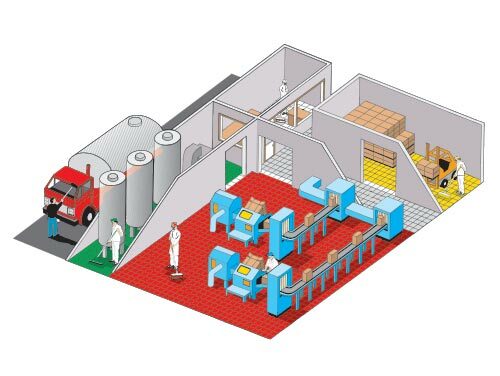 By using colour coding in production areas can be separate cleaning zones. Food Processors: often colour code their packaging lines (where finished product is present) from processing or pre-processing. Meat Processors: may use RED for floor and drain cleaning while WHITE tools will be used in all food contact surfaces / areas. Dairy Processors: may use a specific colour on pasteurized product areas versus raw milk areas. Quick Serve Restaurants (QSR): such as KFC and McDonalds or Subway may colour code so that the tools used in cleaning the restaurant area do not find their way into the kitchen. Healthcare Environments: have widely accepted colour coding, which is as follows RED = Bathrooms and toilets, GREEN = Kitchen Areas, BLUE = General Cleaning, YELLOW = Infectious Areas, WHITE = Operating Theatres. Wells will work cooperatively with the QA and Production people to identify what is most effective and practical for their particular organization. To discuss your requirements call 03 9699 8999 (AUS) or 09 263 9332 (NZ) or complete our online enquiry form. Identify hazards: This looks at determining what are the potential hazards and the severity and risk of each hazard. This has to be done from the start of production to the end. Critical Control Point: This looks at determining how to manage the identified hazards. Critical limit: This means setting limits based upon the Critical Control Point. Some may already be defined by regulatory standards or guidelines. Monitor: This looks at establishing a system that enables the firm to monitor the control limits established before. Corrective action: A plan is needed to establish to take corrective action once monitoring has shown that a Critical Control Point has been broken. Verification: This section looks at creating procedures to ensure that the HACCP process is working correctly and Verification should involve internal and external audits. Documentation: Establishing documentation about all procedures and principals about the related areas above is needed. Records are needed to verify that the system is working.